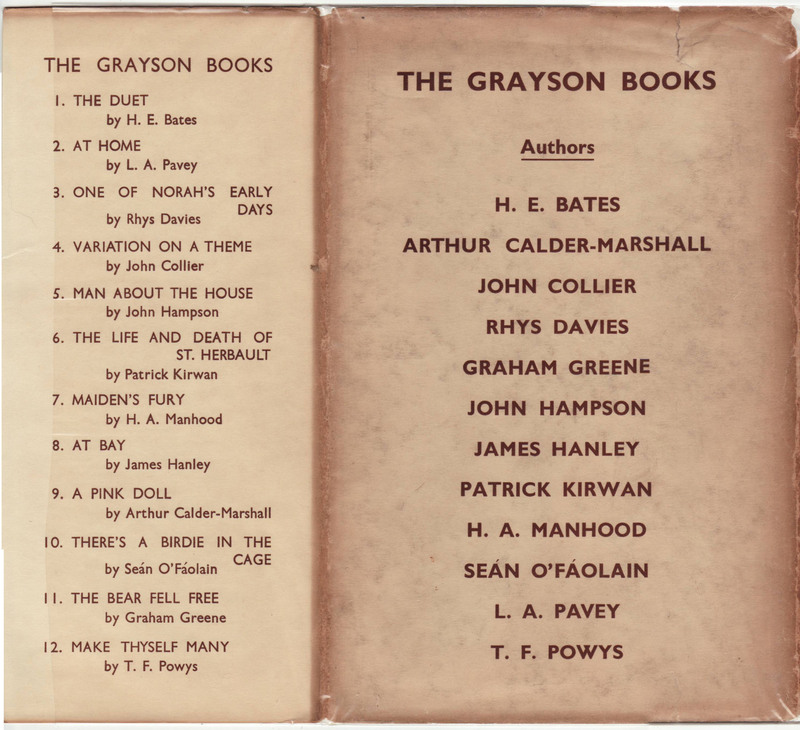 The 12 titles in the Grayson Books series were issued after Nash had left the firm, under the Grayson and Grayson imprint. 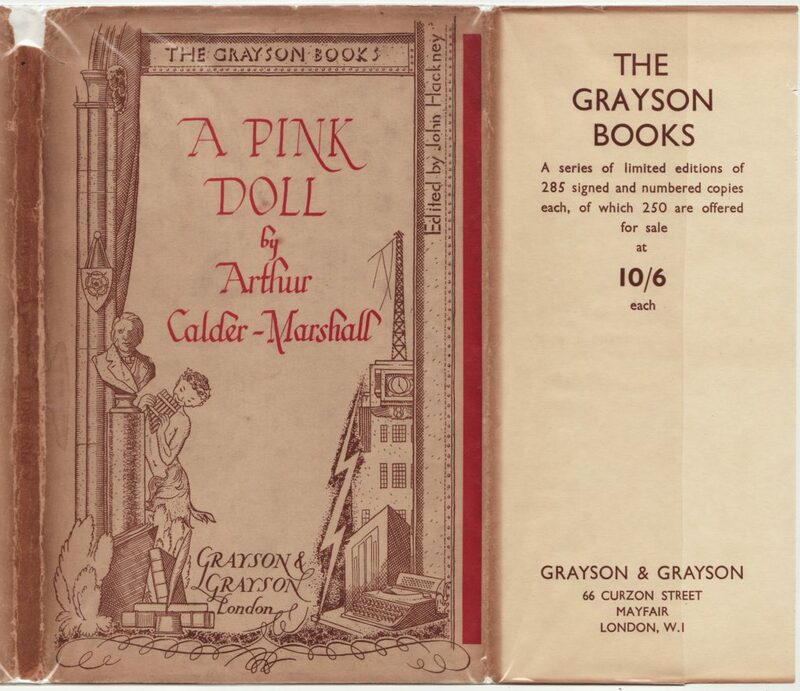 All were short works, original to the series, limited to 285 (250 sold to the public) books, all signed by the author and all printed in 1935. John Hackney was the series editor. The books were advertised as a “collectible” series from the start, and given their limited numbers and author’s inscriptions a few, by authors such as Graham Green, have become very valuable. Arthur Calder-Marshall’s A Pink Doll was published in 1935, as were all the 12 titles in the series. 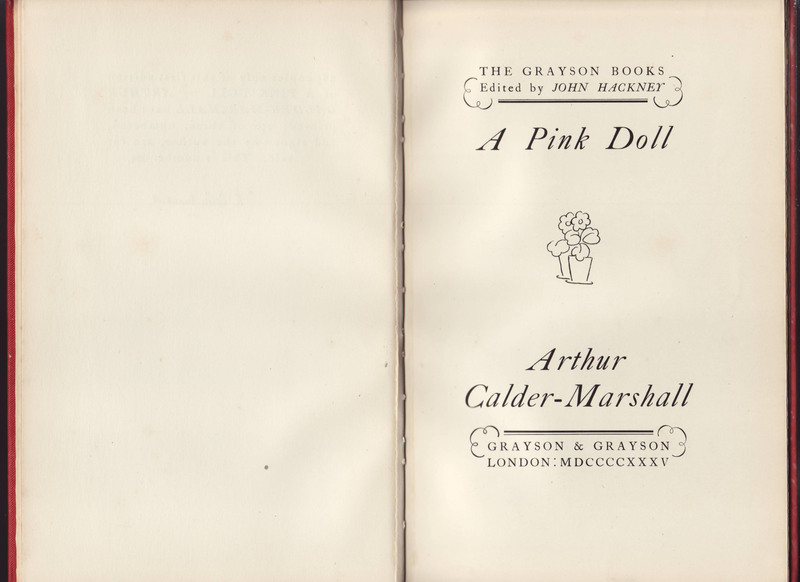 Calder-Marshall published a dozen novels in the 1930s and 1940s and wrote movie novelizations in the 1960s. The series jackets are common to the series. 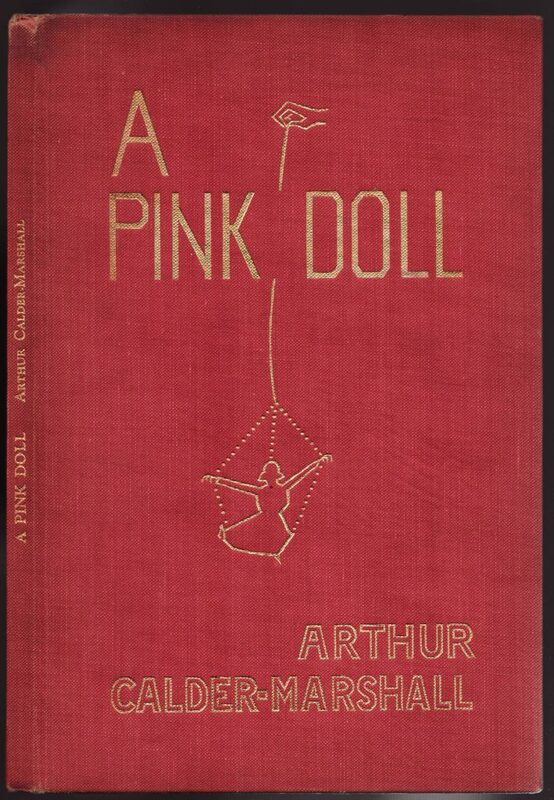 with the author and title printed in red ink over a common jacket design. The common cover illustration is a bit odd: pan (playing, quite unsurprisingly, a pan flute) stands aside a bust, books with a quill pen, while on the other side of the jacket a typewriter and building with a radio tower zaps the ground. This seems to be some way of symbolizing the old and the new? Who knows. 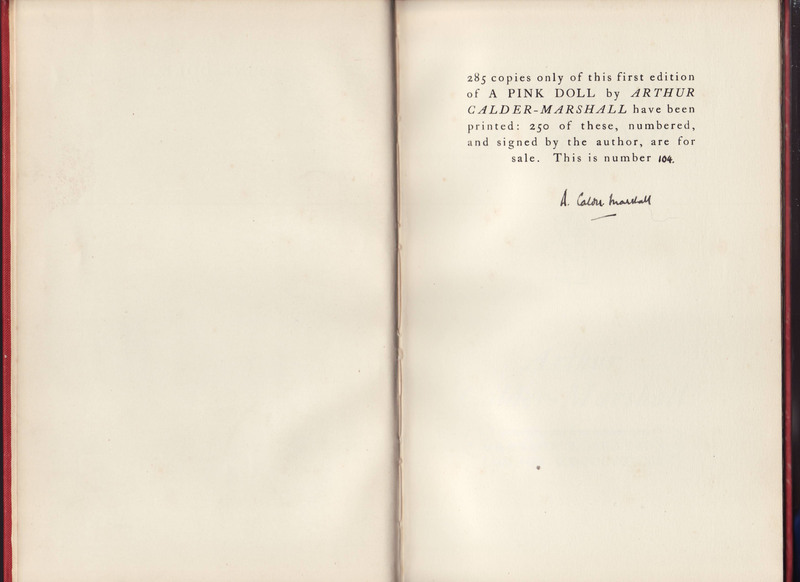 The series name is included at the top of the jacket, and the series editor, John Hackney, is somewhat oddly set on the perpendicular, top left of the jacket front. The front jacket flap includes the series name again, with an indication of the limited edition information and the price of 10/6 each. The Twelve and only titles in the series are listed on the back jacket flap. The rear of the jacket contains the 12 authors in the series. The titles are numbered on the jacket, but the series number is not indicated on the books or dust jackets. 10. THERE’S A BIRDIE IN THE CAGE by Sean O’Faolain. The books are bound in cloth with varying colors and each title has a unique design on the book cover. 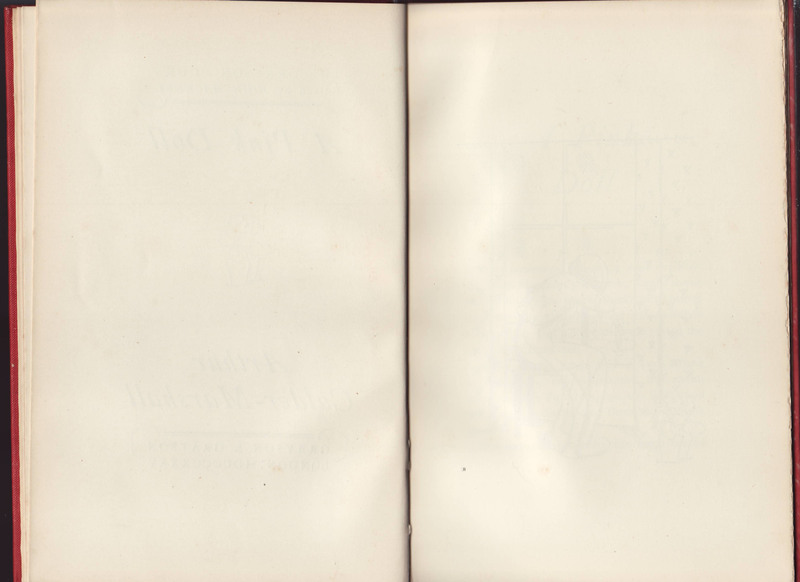 The series name is not indicated on the bookbinding. 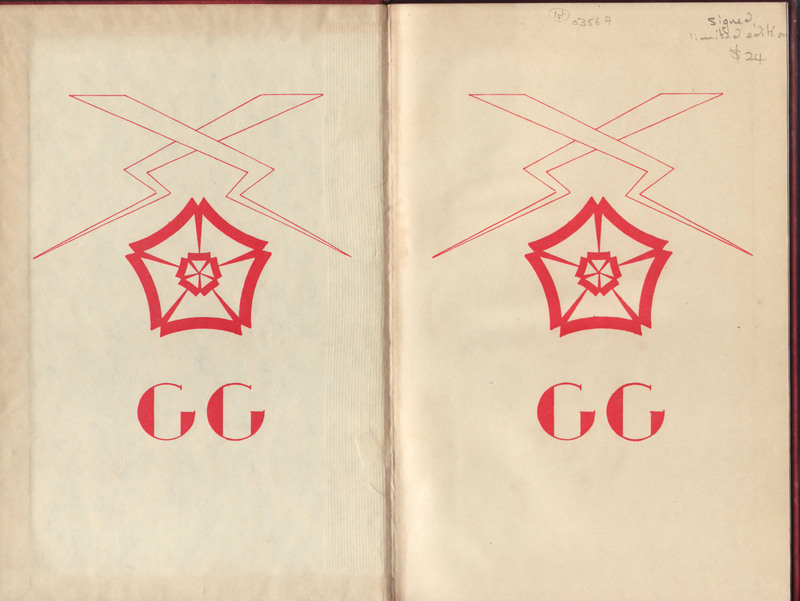 Endpapers include the GG monogram with crossed lightning bolts and a stylized flower design, vaguely reminiscent of the jacket design. The limited, signed edition with the book’s number (this one, #104 of the 284 books printed and signed. A pleasantly light title page includes the series name, editor, imprint, and date of printing (1935). 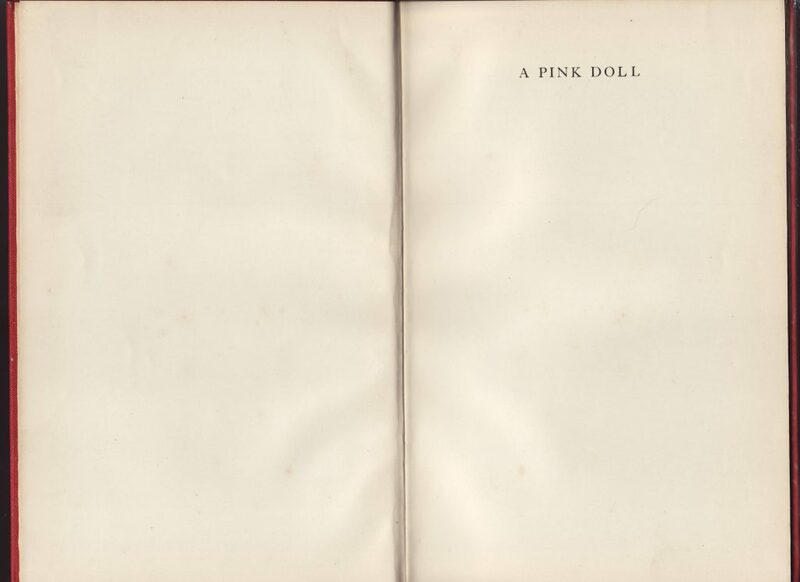 Nothing is printed on the reverse of the title page. 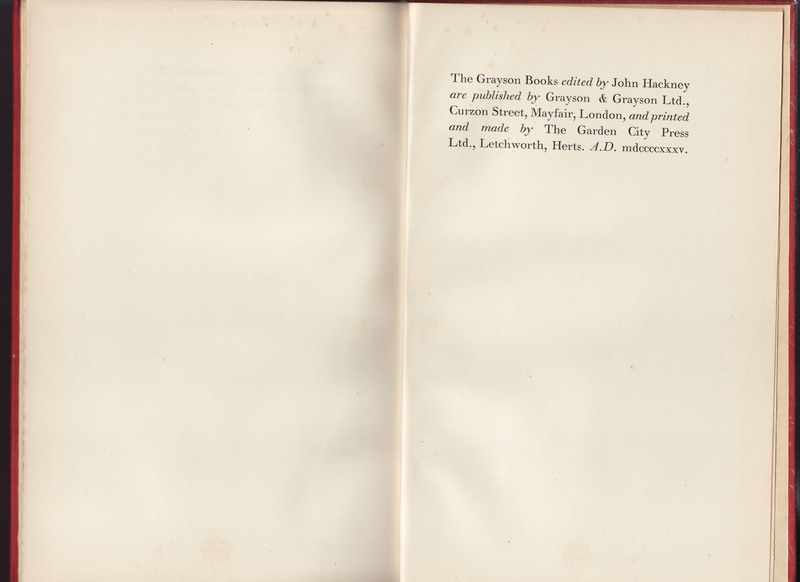 The books were printed by the Garden City Press in Letchworth, which was the printing plant of J.M. Dent & Sons.